Denver’s Hotel and Transit Center Program is an ambitious project that combines a commuter rail transit center and a 519-room Westin hotel to create a new gateway to the main terminal that incorporates sustainability goals. 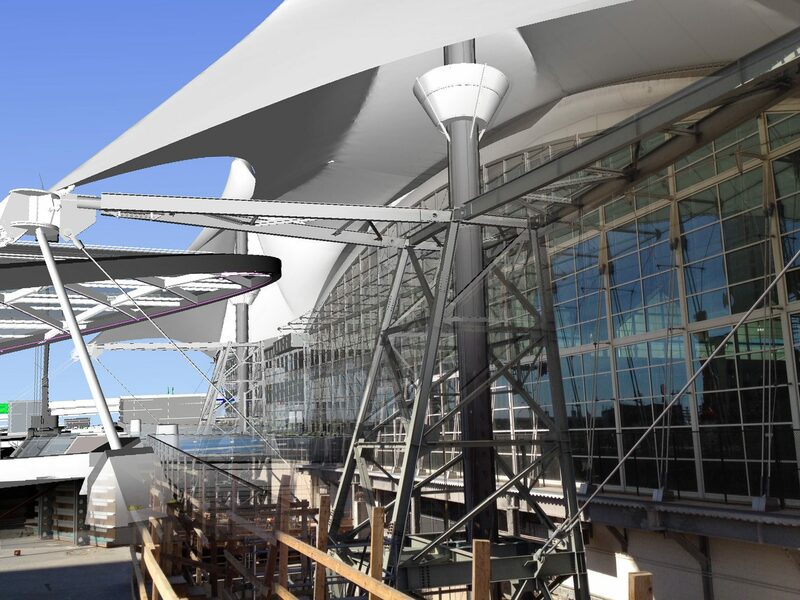 The building information modeling (BIM) process employed for the design and construction of the Hotel and Transit Center Program at the Denver International Airport (DIA) is a unique and forward thinking effort that kicks off an even more ambitious airport-wide BIM conversion that will greatly improve ongoing facility management and maintenance. DIA is the fifth busiest airport in the United States, and the largest in terms of area (53 square miles), which means that there’s a lot to manage, and a lot of wear and tear at this international airport. Any airport project poses challenges given the need for added security, the need to report precise building location for the oversight of the Federal Aviation Administration (FAA), and the need to minimize inconvenience to travelers. DIA’s BIM model-based approach aids a faster construction pace with coordinated project timelines and impressive collaboration around a central model, but this project is just the start for the airport’s broader vision. To achieve the facility-wide BIM effort, the airport first contracted with AECOM to scope and manage an overall airport BIM plan. The airport expansion with the Hotel and Transit center provided a great test project for a fully integrated BIM effort. This program-specific BIM management work is being spearheaded by HNTB. Both the airport and program-based BIM managers and design and construction teams work together to aggregate and integrate the model with other core systems. DIA is now nearing 20 years in age which means the facility has increasing maintenance needs. 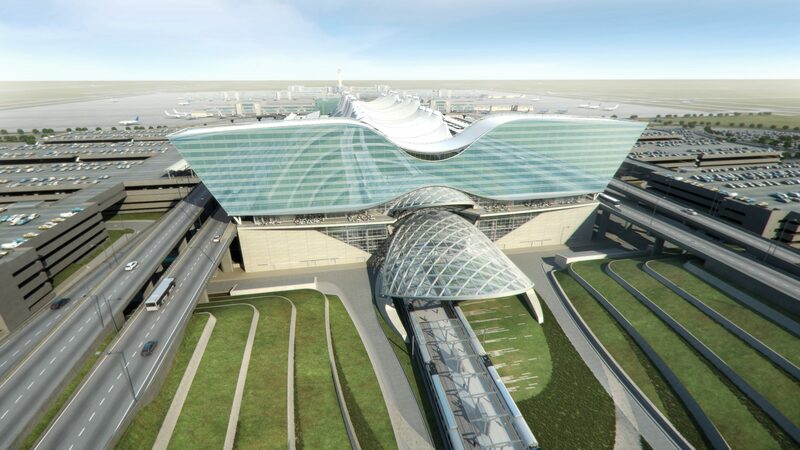 Noting the benefits of BIM on the Hotel and Transit Center Program, DIA moved to implement BIM for use in the day-to-day asset management of the entire airport facility. When fully implemented, DIA hopes the BIM system will make maintenance of the airport infrastructure more efficient, which in turn saves time and money, and improves quality. DIA’s push toward BIM for maintenance is strategic for long-term benefits. This building effort is the first step in a conversion of the whole airport into using the BIM model as the primary source of data for facility management. For example, when fully implemented, DIA personnel will be able to access through BIM information on when an item was purchased, the cost, the item’s specific location, when it was installed, the maintenance schedule for the item and other information important to maintaining the airport facilities. The airport is implementing an automated, bi-directional information exchange between the BIM model and the Facilities Management platform that will greatly reduce risk, and will result in time and cost savings on accuracy alone. When the airport was built in the early 1990s (opening in 1995), the move from hand drawing to CAD was still fairly new. As a result, there are a great many drawings, but they were all on various disks, drives and file cabinets. A first step to the overall BIM project was bringing more than 9 million CAD files together in one place so that they can be cataloged. Unfortunately, because of the limitations of this prior technology, there is no ability to identify which files are the most accurate. This points to a key benefit of a model-based approach where the model is updated continuously and becomes the central point of truth. Getting to the point of coordination, and integration with other systems, took a good deal of staging, with 18 months of planning before any project documentation began. Getting to consensus wasn’t the easiest process as the team needed to talk to all the firms involved about collaboration on the BIM process. At first, many companies held back because they had the feeling that their process was too unique. Part of the early effort involved capturing the existing conditions, above and below ground for the interface of this new construction project with the existing building. The integration of the point cloud into the model, along with survey data, assured an accurate building location. The data capture of the Terminal Building included LiDAR scanning of the first three bays from the roof down to the ground. The scan assisted modeling the building to a high level of detail with everything modeled down to 6” in size. Using LiDAR to model the interior took place over three evenings (1 a.m. to 4 a.m.) with 60 to 80 foot scans. The scan data was compiled into a digital image, and from there it took four to six weeks to create the full model of the existing building. Maintaining the anchoring for the white tension fabric roof provided a challenge in the early planning and design stages. 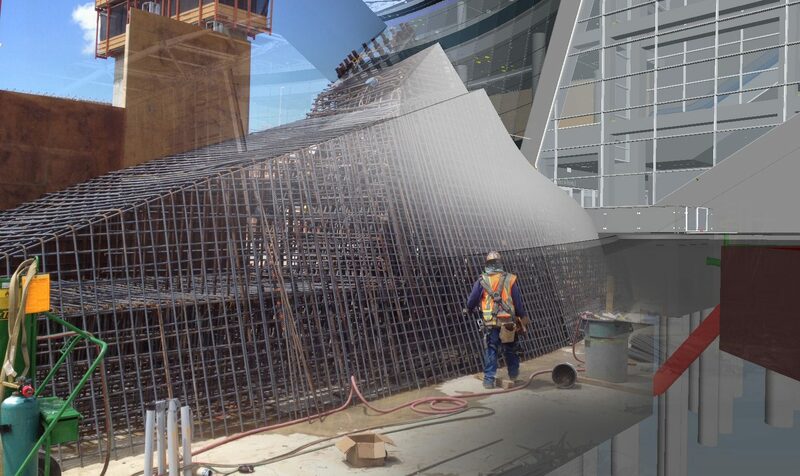 This photo/model composite shows the detail of the temporary grounding tower, and a window into the final support structure at this dramatic entry point to the main terminal. Credit: William Lineberry, Design Technology Manager, HNTB. On the design side 25 different firms created models and content, with some of those firms having multiple models, for well over 40 models total. 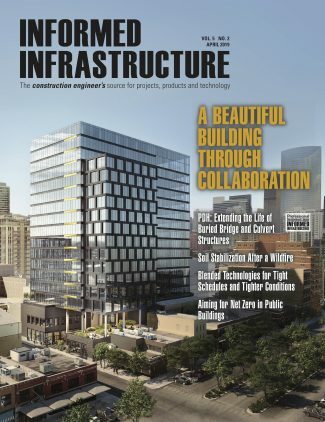 On the construction side, there are ten firms creating content across 25 different disciplines. The train is another element with its own models that are coordinated by the Regional Transportation District (RTD). Essentially, the workflow starts when the designer creates a Revit model, which is then reviewed in Autodesk Navisworks Manage project review software where spatial coordination takes place, and it becomes a construction document that goes to the contractor. The contractor uses the model to create their own shop drawings with detail. The shop drawings contain the greatest amount of detail, such as with the ductwork for fabrication. These files include duct joints, turn locations in ductwork, valve locations in piping, and how all the connections are made. Early in the design there were weekly design review meetings where any problems were discussed and resolved. Later in the process the move was toward spatial coordination, where the model was analyzed for design or construction conflicts. Now the project has moved to construction model coordination where all the trades are modeling how it will be installed, down to hangers and flanges. The teams meet twice weekly to check for conflicts on upcoming work. The construction fabrication model comes back into the Revit model and gets justified and inspected to verify that everything is within tolerances that are spelled out in the BIM plan. If there’s a discrepancy, an RFI is generated and the Revit model gets realigned so that it always reflects what happens out in the construction site. At the end of the project, the client will have an as-constructed Revit and Navisworks model and that will connect to DIA’s commissioning data. The building will be commissioned, and that commissioning data will go into a SQL database. The Revit model will be linked to the SQL database, and also linked to the Maximo facility management system. The all-digital approach was a challenge for some firms as it meant a change in how they had been doing work up to this point. Another problem beyond the need to educate different groups of the whole design process were issues around ownership and liability. With a seamless flow of models, the disconnects between the design and the final finished building go away. Significant issues of building performance have occurred in isolation in the past, without validation from engineers, and without simulating the impacts of mechanical changes. Traditionally, documenting that change would happen in an RFI process, but often it would never get returned to the engineer, and it wouldn’t get recorded back in a drawing. Most times job-site changes don’t impact mechanical performance when they aren’t fully constructed as designed. Another issue however is when clashes in ductwork or piping occur, leading to a time consuming and costly fix. The owner understands that paying for changes during construction is the most expensive point in the process. Clashes balloon into a huge cost, so if you can handle that during design it has cost benefits. When you implement BIM, there are cost savings in reduced work and reduced change orders that are hard to quantify as the money that isn’t spent can’t be tallied. Another area of industry change has to do with the role of engineers and draftspersons. The lead engineer needs to participate in modeling, but they resist because they associate it with drafting. This change presents a paradigm shift on who and how the work is done. With such a large job site, and a coordinated central model, making the model accessible to the workers had always been a goal. Given the issues with unwieldy plan sets, the contractors were willing to try electronic file sharing with iPads. Without this digital device there would have been a need to coordinate, store, share and secure thousands of paper plans on site. Instead, there are daily updates on all the iPads, and each of the trades can have a copy of the most current model in their hand. A worker can be looking at their iPad and a detailed model for tying re-bar. 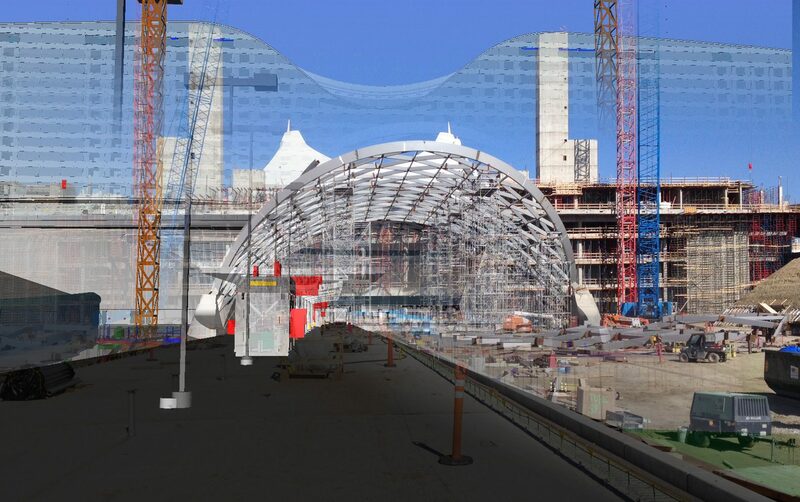 This is done with Autodesk’s BIM 360 Glue, that allows them to easily visualize the 3D model, pan around and see the plan in context to where they are standing. With so many workers actively using the model on the site it’s not uncommon to see 15 to 20 people holding an iPad. 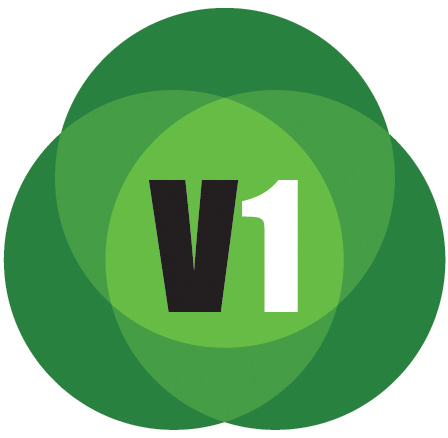 The feedback has been very positive for its ease of use and quick up-to-date access. The time saved, and safety gains of not having workers walking across an active job site are further factors that are hard to quantify in terms of their dollar value. An additional benefit is that everyone involved in the process has access to the model, where they can see it and use it to visualize the building in a way that makes sense to them. Having that detail, they can understand the points of assembly and how their work fits into the overall process, identifying any problems well in advance. The detailed and comprehensive model of the South Terminal Redevelopment Program includes both above- and below-ground infrastructure as illustrated in this photo/model composite of the West Platform. Credit: William Lineberry, Design Technology Manager, HNTB. The airport uses CAD, BIM and GIS on a regular basis for a number of different operations. GIS is the ‘repository of truth’ for deliverables to the FAA, and to provide the less granular view of the world. New information is provided by BIM platforms (Civil 3D or Revit) for authoring. In addition to being the authoring tool, BIM is also platform used to integrate all building infrastructure. Maximo is used for facility management. To continue to maintain the sync of these systems, there are bi-directional updates to all systems on a regular scheduled basis. BIM has the benefit of coming from the authors of the information in either the design or construction process. The designs are created by the experts of the information, with the model corresponding to the exact location through survey input. The models are detailed with attributes and specifications that can be pushed to both Maximo and GIS, with no manual data entry at any of the integration points. The model is just a starting point for some of the more detailed facility management tasks. BIM has become the primary author tool for new and ongoing projects at DIA. The model will be used for maintaining the critical systems that run the airport: mechanical, electrical, plumbing and security. The process is about creating a detailed model that informs all ongoing actions, and not on creating visualizations. While this major expansion illustrated the full scope of a BIM project with transition to operations, DIA has also been using this approach to capture information in other parts of the airport on smaller projects. It wouldn’t be cost effective to create a highly detailed as-built for the whole facility, but by expanding the model with each project they will slowly fill in the gaps in the model. Where there are gaps, there is an overall skeletal model for the entire facility that then accepts the greater detail as it becomes available. One of the benefits ongoing is the ability to do detailed feasibility studies with the model. You can quickly design and scope a new element, based on a detailed model of what is currently there. If the project is approved, then the early conceptual feasibility work helps to jump-start the design. Having the model to do the study eliminates the need to survey and measure and capture what’s there. Avoiding lengthy and expensive consultant time on feasibility studies adds up to big savings over time. This effort is truly at the forefront of BIM model adoption for this scale, scope and integration with operations. While there are clear benefits, there are also many hurdles. 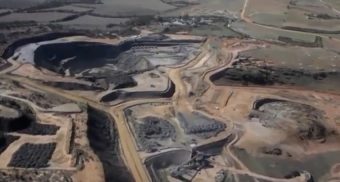 The Central Role of BIM for the Hotel and Transit Center Program at DIA from GeoSpatial Stream on Vimeo.